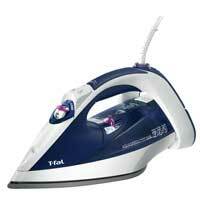 A more than competent steam iron that rests upright on a sturdy triangular base, the T-Fal FV5266 contains 67 steam holes in its ceramic soleplate that improve the steam circulation. To prolong its life, the self-cleaning system includes an anti-calcium valve that reduces scale buildup. The 10-ounce water reservoir is large enough that you don’t have to refill it often. We were satisfied with the steam output of this iron and its ability to smooth out tough wrinkles and get up close to seams and buttons. The cord comes out of the back of the handle so it stays out of your way, but for $90 we wish it had a retractable feature. Continuous steam at 30 g/min. and burst of steam at 90 g/min.